Growing herbs seems to be a feast or famine venture. Spring and summer are the bountiful months and that is great. Nothing makes food taste and look better than fresh herbs, not to mention the satisfaction of using something that you have grown yourself. There are herbs that thrive during the fall and winter, but so many of the summer herbs are needed during the colder months of the year. When someone in your family gets hit hard with a cold or the flu, it would be nice to have some of your summer medicinal herbs on hand. Not to worry! There are several easy ways to preserve herbs for both internal and external use. Let’s start with the methods and plants we can use internally. Almost any herb can be used in a tea, tincture, or infusion. I am focusing on the ones that have the widest range of uses and that can be grown or foraged with ease: pine pollen, lemon balm, thistle, yarrow, plantain, and sassafras. Pine pollen can be foraged February through April, depending upon your location. Pine pollen is a superfood, rich in vitamins and minerals, with over twenty amino acids and all eight of the essential amino acids. Pine pollen increases stamina, libido, and general vitality. It lessens the impacts of aging while increasing energy levels and mental integrity. It has anti-inflammatory, anti-arthritic, and anti-tumor properties. 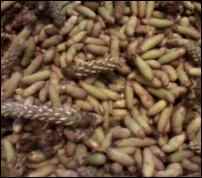 Collect pine pollen in paper bags when the catkins are yellow and powdery. Put the yellow catkins in a metal bowl, cover with a towel, and let sit overnight. Sift until you have released the pollen from the catkins. The pollen you sifted from these mature catkins can be stored in a glass jar in the refrigerator. Sprinkle over food or add to smoothies. Green Catkin Honey: Place the younger, green catkins in a sterilized canning jar. Cover with local honey. Store for two weeks, mixing daily. To mix, stand jar upside down for several hours. In two weeks, strain catkins from honey. Use pine pollen honey anywhere you would use regular honey. It has a bright, floral flavor. 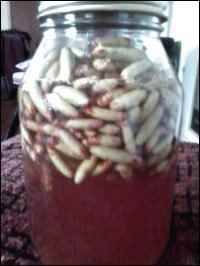 Pine Pollen Tincture: Combine two parts 100-proof alcohol to one part pollen in a glass jar. Shake daily for two to three weeks. Strain through a cheesecloth into a dark glass bottle. Add ½-1 teaspoon to herbal teas. Sassafras was an important part of home medicine for the early American colonist who learned about the medicinal properties of sassafras from the Iroquois. It was used as a blood purifier, as a tonic after labor, and to prevent colds and fevers. Sassafras is an herb that is not recommended for women who are pregnant. The sassafras tree begins to put on tender leaves in early spring. Fresh leaves are great for tea and you should use fresh when it is available. But because sassafras tea relieves throat infections and colds it is a good idea to preserve some for the winter. Pick sassafras leaves when they are new and tender. Refrigerate in a paper bag until they are dry. Sassafras tastes great with mint so it is a good idea to pick and dry mint leaves while gathering sassafras leaves. Your sassafras and mint blend can be stored in a ziplock bag or glass jar in the pantry. When you feel like you might be coming down with a bug, start drinking this delicious tea. If you didn’t gather any sassafras leaves this spring, or if you run out of the leaves you dried, you can use the bark or roots of the sassafras tree to make tea year-round. Yarrow tea can be found at every health-food store but once you have it growing in your yard, you will have it forever. It is an extremely easy to grow perennial. It is an excellent plant to have, especially if you have children because it is gentle enough for them to take. Yarrow tea is used to reduce fevers, shorten the duration of colds and flu, improve relaxation during illnesses, and relieve cramps caused by illness or hormones. To make yarrow tea, simply pour boiling water over two tablespoons of dried yarrow (leaves, stems, and flowers) and steep for 8-10 minutes. Sweeten with honey. Internal usage is not recommended for pregnant women, as it can cause uterine contractions. Gather the plant once it flowers and hang upside down in a paper bag until dry. Once dry, chop into usable pieces and store in an airtight container until needed. Lemon balm tea has been used to ensure long life and protect against dementia since medieval times. To make a lemon balm tea, pour one cup of boiling water over one tablespoon dried lemon balm leaves and steep. Lemon balm is so beneficial and so gentle, it is a good tea to drink every day. Lemon balm relieves anxiety, depression, insomnia, migraine, and nervous tension. It is good for the circulatory system, working as a heart tonic, relieving palpitations, and lowering blood pressure. It is also used for respiratory conditions such as asthma, chronic coughs, colds, and flu. It also helps with digestive issues, relieving colic, indigestion, and nausea. Lemon balm is another herb gentle enough to give young children. You can gather the leaves of lemon balm as soon as they begin growing. Because lemon balm loses potency during the drying process it is best to make a tincture and/or infusion for winter use. Lemon Balm Tincture: Fill a glass jar ¾ full of lemon balm leaves. Cover leaves with 100-proof alcohol, making sure all leaves are submerged. Cap with a non-metallic lid and store in a cool, dark place for four to six weeks, shaking daily. Strain tincture into a sterile jar and store in a cool place for up to one year. Take ¼ teaspoon as needed. This is a terrific stomach soother with anti-viral properties. Lemon Balm Infusion: Fill a clean glass jar ¾ full of lemon balm leaves. Cover with local honey. Using a knife or chopstick, poke around sides of jar to eliminate air bubbles. Turn upside down once a day for three to five weeks. Strain honey into a sterile glass jar and store in refrigerator indefinitely. Use as you would plain honey. Milk thistle is an antioxidant, anti-inflammatory, anti-carcinogenic, hepaprotective, and immunostimulating herb. It was approved in 1986 as a treatment for liver diseases and is widely used to treat alcoholic hepatitis, alcoholic fatty liver, cirrhosis, liver poisoning, and viral hepatitis. It also works to detoxify synthetic chemicals in our bodies so it is good to have around if you or a family member is on a strong course of medication. Thistle was used in medieval times as a tonic for the nervous system. It was used for treating depression, anxiety, and other nervous conditions. It was believed to help people maintain a relaxed, calm, and peaceful disposition. To harvest thistle, cut seed heads off plant when the seed heads have turned brown. Put them in a paper bag and store in a cool, dry spot for 48 hours. Lay a towel on your work space and carefully brush seeds from the seed head. Remove all of the debris and store seeds in an airtight container. Thistle Tincture: Grind ¾ cup thistle seeds in a blender. Put ground seeds into a clean jar. Add one cup of water and one cup of 100-proof alcohol. Store in a cool, dark place three to five weeks, shaking daily. Strain tincture into a dark glass jar and store in the pantry. Add one teaspoon to your herbal tea. Now let’s talk about the herbal preparations to use externally. Lemon balm, yarrow, nettle, and plantain all make excellent bath teas and infused oils. Lemon balm is a terrific skin restorative. You can add it to any bath tea blend or make a strong lemon balm tea and add it to a hot bath. Another way to preserve lemon balm for external treatment is to make a body spray. Lemon Balm Body Spray: Gather a large amount of fresh lemon balm leaves. Tear into pieces, bruising the leaves to release the essential oil. Loosely stuff into a clean, dry jar, leaving an inch of head space. Cover with witch hazel, taking care to submerge all the leaves. Let this mixture sit for three weeks before straining into a clean jar. You can use this mixture as you would regularly use witch hazel or you can dilute with an equal amount of distilled water to use as a body spray. This mixture is great for soothing and toning skin, relieving itchy skin, and it encourages healing from cuts and scrapes. Greek myth tells us Achilles was held by his heel and dipped into a pool of yarrow, making him invulnerable to arrows. The wound that killed him was on the heel that was not immersed in yarrow. I haven’t personally tested the arrow theory, but I do know yarrow works great on rashes and dry, itchy skin. Dry yarrow as you would for internal use. You can add yarrow to any bath tea blends because it also relieves itching caused by dry skin or bug bites. One of my favorite yarrow bath products is made by grinding the dried plant material in an herb grinder until I have one cup or more. I add this to three cups of epsom salts and store in a glass jar on the side of the bathtub. It is perfect for the itchy skin and sore muscles that can happen in the garden. 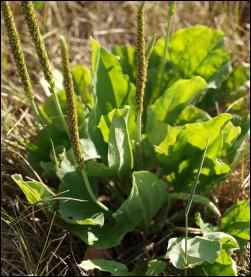 Plantain leaves are antibacterial, astringent, anti-inflammatory, and antiseptic. The leaves will quickly stop a flow of blood and helps repair damaged tissue. The leaves can be heated and used as a wet dressing for wounds, skin inflammations, ulcers, cuts, and stings., Plantain infused oil works wonders on eczema and sunburns. Plantain Infused Oil: Gather twelve to fifteen large plantain leaves. Stack them together and slice thin. Place in a clean, dry jar and cover with olive oil. Poke around the edges of the jar to eliminate any air pockets. Make sure all of the herb is submerged in the oil. Store in a sunny place at room temperature for four to six weeks. Shake daily. Strain out plant material and allow strained oil to sit for a few days. Bottle your finished oil in dark jars. Seal and label. Store in a cool, dark place. Nettle is another herb that is soothing for insect bites, eczema, acne, and chicken pox. You can make bath salts with nettle and epsom salts, but since I don’t love the way it smells, I like to use it in a bath tea blend. Soothing Bath Tea Blend: You need an equal amount of dried lemon balm, dried yarrow, and dried nettle. You can also add an equal amount of dried chickweed if you like. Combine in a large metal bowl. Add ½ cup of oatmeal and ½ cup of powdered milk. Fill muslin or cheesecloth bags with mixture. If these are just for home use, a thin sock will work. Throw a bag into the tub while the water is running. You can use the bag as a washcloth or just soak in your herbal bath. Feel free to add any other herbs or flowers to the mixture. The great thing about making your own herbal blends— whether you are using them internally or externally—is that you know what special needs you and your family have and you can adjust your blends accordingly. Although herbs have been used both to prevent and heal medical conditions, please use common sense when using herbs for treatment. If you are on medication, consult with your doctor before adding any medicine, herbs or otherwise, for possible contraindications. Use this article as a jumping off point for your own research. Using herbs has enriched my life and it is my hope that your life will be enriched as well.